A year ago I came to Wyoming. In 2001, I had driven the southern portion of the state west to east. I vaguely remembered being in Yellowstone and the Tetons on that drive. Last year is when I began to know Wyoming. 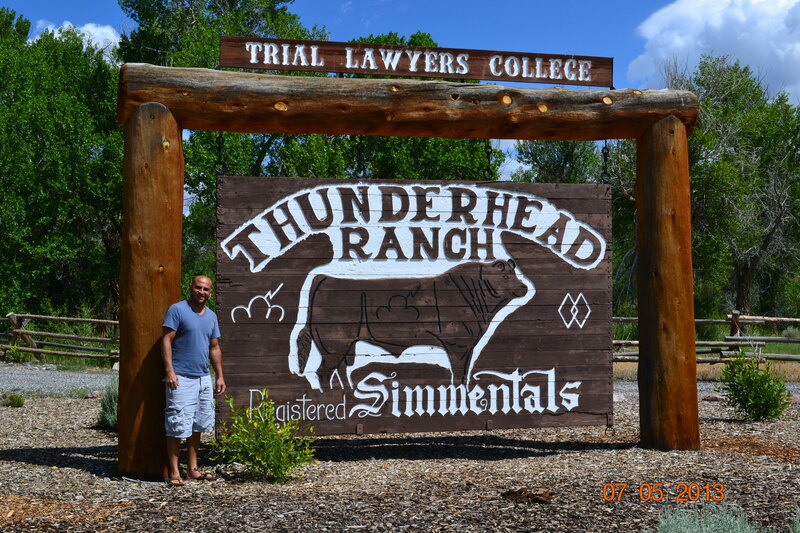 I was out there to attend a three week course at the Trial Lawyers College. The College was created by Gerry Spence to teach lawyers humanity and how to truly communicate. Its located in Dubois which is about an hour and half from Jackson. The College is located ten miles off a dirt road. 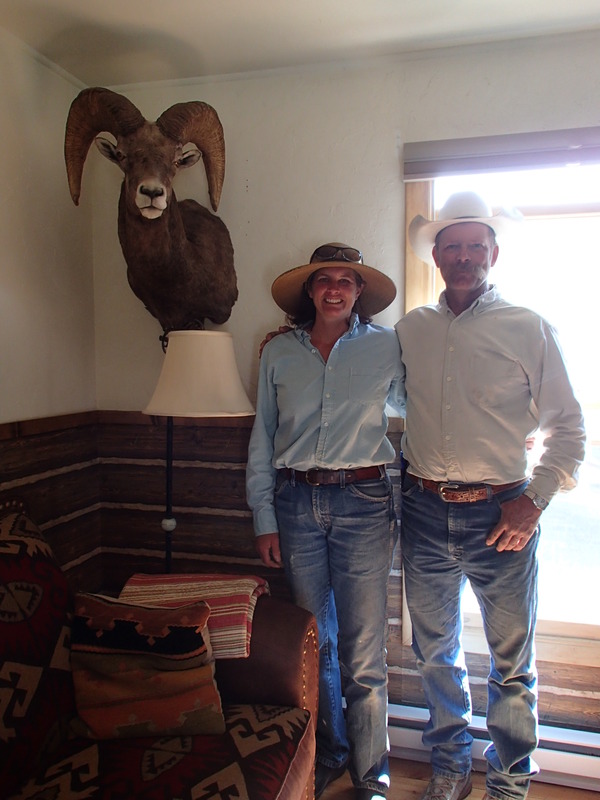 The property was previously used to ranch and is now called Thunderhead Ranch. The most important lessons were how to empathize with people and we all have issues. It’s an experience that I don’t want to characterize in words. Anyway, I had a few chances to get off the ranch and feel Wyoming. I also was reading Gerry’s biography. It’s a land of cowboys and vast land. I enjoyed being out there. I made sure on this trip to see those involved with the ranch. Before we entered Wyoming we had visited five other lawyers who also attended the college with me. As soon as we exit Highway 80, the pavement ends and there is nothing but a trailer selling fireworks. No gas station, no fast food, no buildings. Just dirt pounded into a flat track. Surely this is not the road to Lori and Mike’s house. Lori is a good friend with a sense of humor and the registrar of the College. Mike, Lori’s husband, is a well rounded guy that can discuss wind energy to politics while drinking quality beer. After a call to Lori, we were assured this indeed was their road. Their home, simply put, is removed. Their home has lots of atmosphere and historical décor. The most notable aspects were the antique, very ornate furnaces and the wind generator that provides all their power and then some. Mike has a dream garage that I wanted to take with me. We are in Buford, Wyoming where there is a dearth of people. During our journey, one of the most surprising aspects is the amount of people who live in small remote areas. When I was younger I desired obscurity. A small wooden boat with a line or two of color around it in the Mediterranean I thought. I would be tethered to this wonderful ship while living a simple hidden life in Greece. Outside of time away from people an unknown existence. I don’t know why I yearned for that. It was my teenage years, a time where popularity was the most sought commodity. I didn’t buy into it, and I despised that type of value system. I thought if this was the basis of society I could without it. I’m an upstream swimmer sort. At times, I forget that about myself. Like when I decided to go to college in Boston and abandon my Grecian fisherman vision. Or when I pushed aside my want to be a filmmaker and go to law school. But now, the absence of people and their activity seems to be a lonely proposition. It’s not so much that certain stores or services are missing but rather the bustle that makes atmosphere. I grew up in Daytona Beach and the city was only active during a few seasons such as bike week or spring break. Outside the seasons, Daytona was dead, although many people and stores lived there. Key West is much smaller and has much fewer stores and services than Daytona but it is all atmosphere all the time. As we continue, I feel like I again understand this self-imposed exile from society. Lori and Mike’s house has a mesmerizing back porch that looks out to rolling green hills of uninterrupted nature. We spent a full day just sitting on that porch. The porch was filled with entertaining chatter, reading, napping, hummingbird watching, and great food. As the sun set behind the mountains, a dense front of storm clouds way low to the earth paraded towards the sunset. What a force those clouds presented. The clouds, in time, brought a dark sky. Lori ran into her house. Once the sky turned from a warm blue to blackish gray the clouds erupted and brought down m&m size hail. Sarah and I ran to Skyhorse so we could watch the show. We loved watching it. The next day we visited another Laurie. Laurie is the executive director of the College and a rather well put together gal with a big smile. She lived down the same road, except her driveway is two miles long. I think that’s like living on an island. You can’t see anyone unless you traverse your driveway. Laurie is completely off the grid. 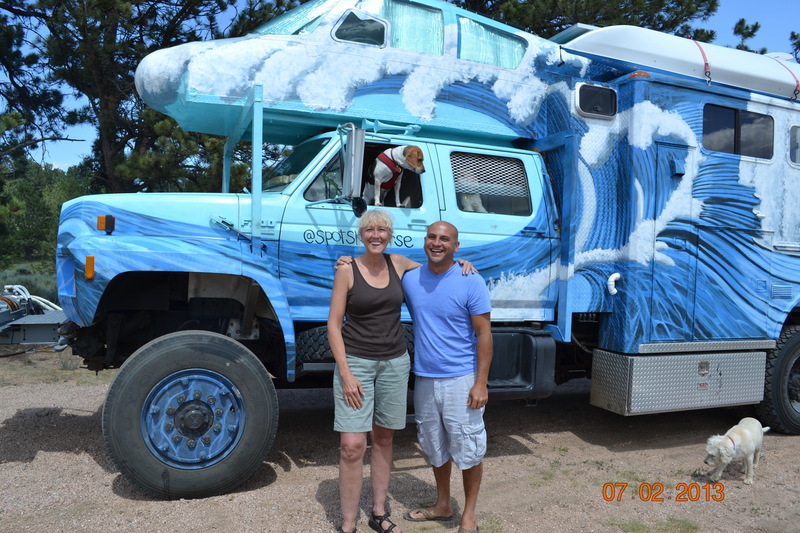 She relies on solar, wind, and a large battery bank for power. The land was so vast, filled with large stones and a lake. 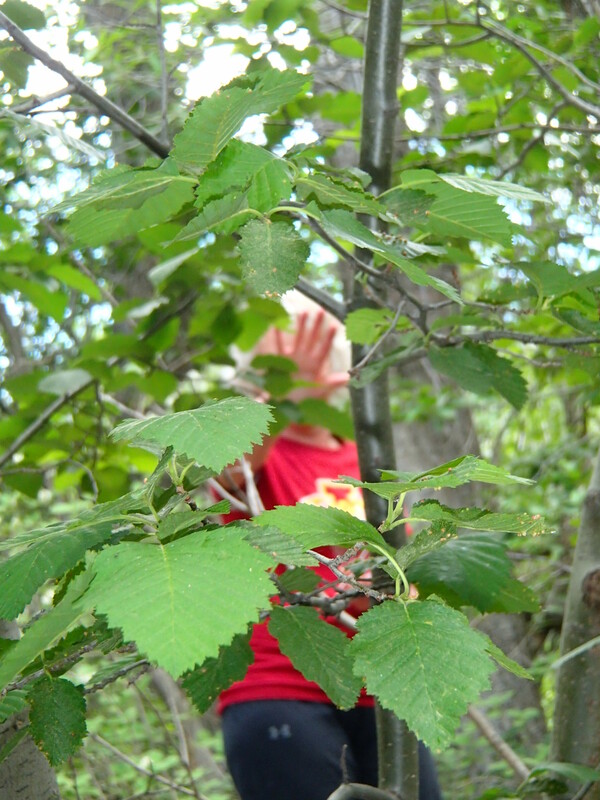 We surprised Laurie as she was in the process of collecting slag, tree remnants aside from the trunk. I will say that I didn’t know Laurie really gets down with nature. We walked the land, ate a Greek salad, and caught up. Next stop, Thunderhead Ranch to see the ranch managers Greg and Kate. I first met Greg when I was at the conference. He wears a cowboy hat. But that’s not the first thing I noticed about what he wears. He has a magnificent mustache that is the envy of any male. I am a hairy guy and he makes my mustache look like I’m Asian. Kate is a warm individual with a fiery personality. We spent a couple of days on the ranch with them. We went in town for the Fourth of July. We had a blast meeting their friends and watching a lengthy firework show that seemed to have multiple endings.